Christmas is supposed to be the most wonderful time of the year... except when it's not. We go about with the words merry Christmas on our lips, but for some, they are hollow. Such is the case for Maude and Silas and the Unlikely Christmas Party on Wheels that comes to stay at Grey Sage Inn for a few days before Christmas. The pages of this book are filled with realistic characters who are running from Christmas alone or Christmas past. We've all got a Christmas past. A Christmas road trip across the southwest is meant to distract the travelers from their own loneliness or pain. 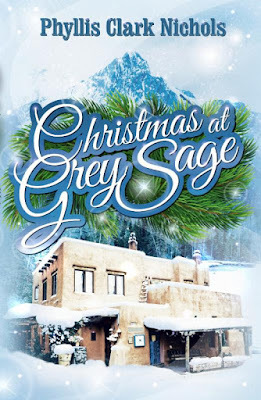 A blizzard in Santa Fe, New Mexico brings about a whole new meaning for Christmas present to both the Unlikely Christmas Party on Wheels and their hosts Maude and Silas who run the Grey Sage Inn. The endearing characters that populate this book each have a pain of their own that must be faced. We forget that we are surrounded by people who are not having a merry Christmas. That's something to think about in itself. Reading this book helped me think through some of the sadness I feel when I think of the people and things I miss from my Christmas pasts, and helped me think in terms of making a new Christmas present in spite of my less than stellar ability to make Christmas this year for my family as I once could. I may not be able to decorate and bake and shop as in years past to make things special, but this year, perhaps just having mom here alive is enough. Doing what I can with the energy I have where I am is enough. Finding joy in the now is what this book is about.There will be Christmas futures that will be filled with excitement and joy and fun. It's okay if they're not all exciting. They're all centered around kindness, love, hospitality, and our savior Jesus Christ. I highly recommend this book. It can be read in a few hours and is worth it—especially if this Christmas is not all you wish it to be. guests discover this Christmas won't be the relaxed vacation they expected. Tension and fear mount as the storm worsens, and Silas, a retired doctor, is called away in the middle of the night to care for a neighbor. The snow and stress unlock tongues---and in the unexpected conversation that follows, secrets and pasts are revealed, and hearts are healed. gone by, the warmth of Christmas brings a renewed hope as these trapped strangers become friends---proof again that the joy, hope, peace, and love of Christmas can be experienced no matter where you are. Phyllis Clark Nichols grew up in the deep shade of magnolia trees in Georgia and weaves her Southern culture into character-driven stories that explore profound human questions. She is a classically trained musician and enjoys art, books, nature, cooking, travel, and ordinary people. After retiring as a cable network executive, Phyllis began leading mission teams to orphanages in Guatemala and now serves on three nonprofi t boards, where she works with others who are equally passionate about bringing hope and light to those who need it most. Phyllis and her husband live in the Texas Hill Country. Sounds like a beautiful story! I will be posting a blog post soon about this very subject...it is so true, Christmas can be a very sad time of the year for many people. Next Christmas will be so much better for you, my friend. Just think how much better you will be feeling by then, and you will look back on this Christmas and see how far God has brought you! Praying for you. Hello! I have posted a comment once before. I enjoy reading you posts. I think of you often and know you are fighting the good fight against cancer. -I was diagnosed with cancer earlier this year and just had a good 3 month checkup after treatment (radiation). This year for both of us there is so much for both of us to be thankful for. Cancer changes your life but I trust in God and He has shown me what is important, so for you and I this Christmas will be special. Merry Christmas. I love books like that! My eyes perked up when you mentioned the location. My mom was born at the southern end of those mountains in New Mexico! I think that's where we used to go hunt for pinons....pine nuts in English. We used to find so many!! We'd sit on the front porch and eat them while playing Jacks!! I still have family there. I'd love to visit again. I'll definitely be putting this book on my wish list. I bought a few books from Mardel's on Monday. Some fiction by Suzanne Woods Fisher and another by Elizabeth George...can't remember the exact title....A Woman after God's Heart??? In any case, i'm enjoying it! I hope you enjoy it Phoebe. Happy Christmassing! This sounds like a great read! It's sad to think that Christmas can be so sad for people. I never understood that much until my mom passed away. It truly isn't the same without her! Merry Christmas Sweet Friend!! Yes, Penny, I have fond memories of "making Christmas" with my mama. I miss her a great deal and it's been 18 years. Perhaps we never stop missing those whom we love best. I look forward to the day of reunion with her in Heaven, but I'm going to do all I can to stay with my own girls and sons and husband here and now. Be blessed, and don't stress this Christmas and New Year's season!